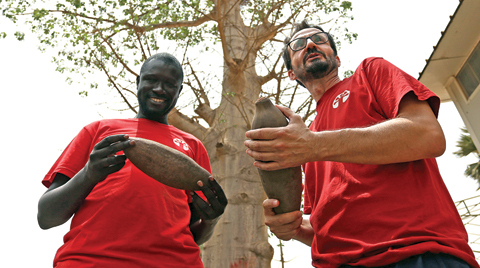 Taerou Dieuhiou has been shinning barefoot up baobab trees in Senegal’s southern Casamance region to collect the oblong fruit since he was 15. Business has never been better. Inside the hard, green shell that dangles from the spindly branches of Africa’s most iconic tree is a citrussy pulp that has become a popular “superfood” in the United States and Europe. Rich in vitamin C, calcium and magnesium, it can be ground into a powder, mixed into smoothies or sprinkled on porridge. Coca-Cola’s Innocent, UK yogurt maker Yeo Valley and U.S. wholesaler Costco are among the major brands to embrace baobab. The imposing tree dots the dry African savannah from Senegal to Madagascar and can live for over a millennium. It can store thousands of liters of water and grow trunks so thick that one South African tree became a pub with a dart board that could hold 60 people. Until recently baobabs were only tapped for local use but in a major business shift a small network of producers and suppliers has pushed the fruit’s profile abroad. While some experts question the boabab’s sustainability, demand has taken off. “It is a better price now. Now I make more for each sack,” said the 31-year-old father of four. He climbs the trunks in ripped jeans and a t-shirt, gripping a long pole to dislodge the fruit from the outer branches. “It’s all I have.” Exports of the hard-shelled fruit rose from 50 tons in 2013 to 450 tons in 2017, according to industry group the African Baobab Alliance. They are expected to reach 5000 tons by 2025, about 500 shipping containers a year. This would make it a $400 million industry. The transformation has started to bring in much needed revenue to African farmers. Baobab des Saveurs, a small company with buyers in Australia and Canada pays Dieuhiou up to 10,000 CFA francs ($18) per sack, more than double what he received from local middlemen a few years ago. Producers and retailers pushed back. They went to trade shows, gave out free samples, launched a #Makebaobabfamous campaign on Twitter. In January, Yeo Valley started to sell a vanilla and baobab yogurt in Britain’s biggest supermarkets. Costco this year introduced a breakfast bowl with baobab and acai, a berry from the Brazilian Amazon. Coca-Cola-owned Innocent released a baobab smoothie in 2016. Unlike coffee or cocoa found in abundance in Africa, baobab is not a plantation crop. It takes so long to mature that farmers rely largely on existing trees to harvest. There is evidence that those trees are under threat. In June, the journal Nature Plants published a paper saying that 9 of the world’s 13 oldest baobab trees had died in the last 12 years. Some of the trees were over 2,000 years old and included South Africa’s so called “pub tree”. Their decline was an event of “unprecedented magnitude” potentially linked to climate change, it said. Dieuhiou has noticed a change. “Normally the rain has started by now, but we have had only one storm,” he said in July. “I have to go to other villages. Before, there was enough right here.” Some producers have planted new baobabs while others have trained farmers to pick fruit without damaging trees.